My name is Chris Skeeters I got out of the Marines in 2012. 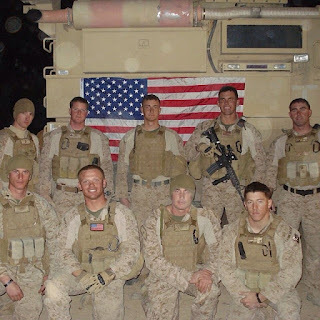 I could tell story upon story of experiences while I was in but instead I’ll tell you about an entire deployment. I was assigned to Combat Logistics Battalion 2. During our time deployed to Afghanistan we experienced many hardships and tough days. There were good times but most were outweighed by the bad. There were times when we wanted to leave but we knew we couldn't because it would mean giving up on our oath to our brothers. It was around Thanksgiving and we were all joking around trying to keep good spirits because we all wanted to be home for the holidays, we sat in the mess hall joking and talking about what we would do when we got home. We never knew some of us would not make it another week and this would be our last holiday together. The following week was very hard. It happened in an instance and there was lots that was left unsaid. This story is familiar to thousands of deployed service members throughout every branch. Why did it happen to them, was there anything I could have done, and why wasn't it me? The days I spent in the corps were great and lots of life lessons were learned. WAR wants to thank you Chris for your service. It is a debt that can never be repayed. And we pray for the families of those fellow Marines lost in battle. Please take a moment to learn more about Skeeters click here.